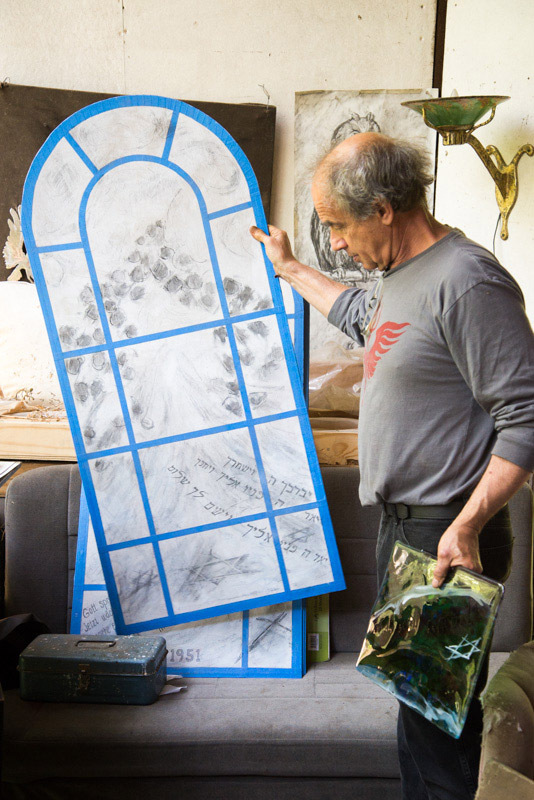 Barney Zeitz will open his studio on Wednesdays in August to display his work in progress. 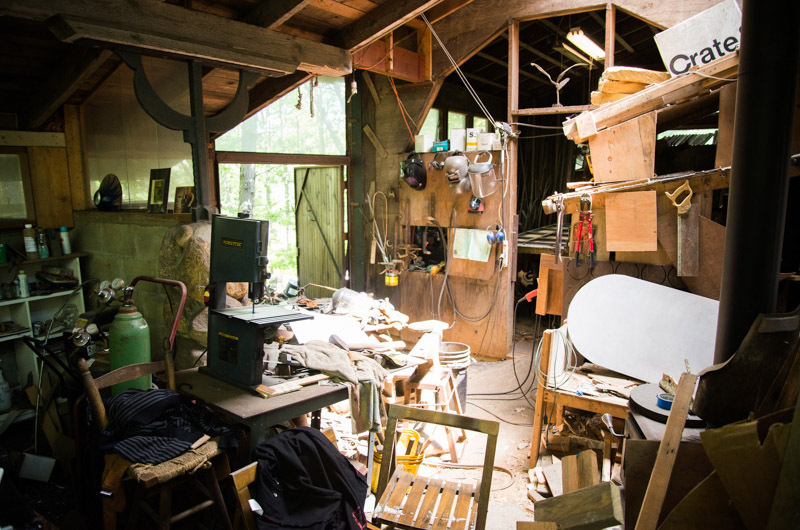 You can barely walk through Barney Zeitz’s studio. It is cluttered and messy with all manner of materials. It is also home to one of the most inspiring projects on the Island. Mr. Zeitz is working on a series of eight-foot-tall stained glass windows, destined for a small Evangelical parish in Flieden, Germany. Built in 1875, the Flieden parish was once a synagogue. On Nov. 9, 1938, its windows were smashed and its pews burned as Nazis stormed Jewish villages and synagogues all across Germany on Kristallnacht. The synagogue remained vacant until 1951, when it was revitalized by locals as a small parish. A few years ago, Marie Ariel, a Jewish woman living in Cambridge, flew to Flieden and visited the parish. Her father had been bar mitzvahed there when it was still a synagogue in the early 1900s. He had come to America before the Holocaust, and never went back to Flieden. Ms. Ariel wanted to see where her father had grown up. She showed pictures of the former synagogue to the town’s mayor, church officials and town residents, who were so moved that they decided to commemorate the Jewish population that had thrived in Flieden for 400 years before the Nazis came with a series of stained glass windows. 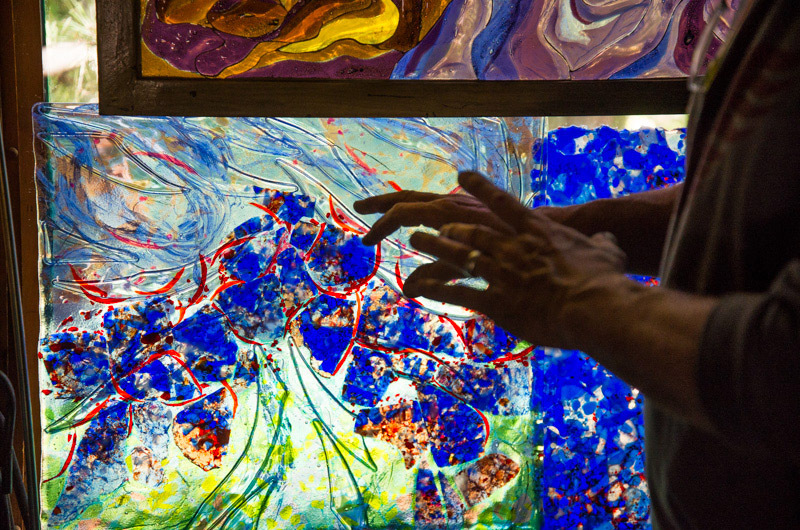 They asked Ms. Ariel if she knew of a Jewish artist who worked with stained glass. Ms. Ariel had Vineyard connections and immediately thought of Barney Zeitz, who lives and works in Vineyard Haven. Mr. Zeitz has been working with stained glass for 44 years. He has put windows in temples and churches all across the country, including many churches on the Island. He jumped at the opportunity, and the parish committee flew him to Flieden, Germany to see the church. Earlier this summer the artist gave a talk about the project at the Martha’s Vineyard Hebrew Center. “This is not a Holocaust memorial,” he said, referring to it instead as remembrance for the Jewish people who had lived in that community. “It was really heart wrenching because these people are carrying so much feeling about what happened . . . I found it really amazing,” he added. The idea was inspired by Arthur Obermayer, who died last year. Mr. Obermayer was a philanthropist and activist, and honored Germans who worked to preserve Jewish history. Mr. Zeitz planned to have the first window done by mid-summer, the second by September, and all eight done and shipped to Flieden in two years. He will open his studio on Wednesdays afternoons in August from 4 to 7 p.m. to display his work in progress. Mr. Zeitz is a mathematician, scientist and artist all rolled into one. 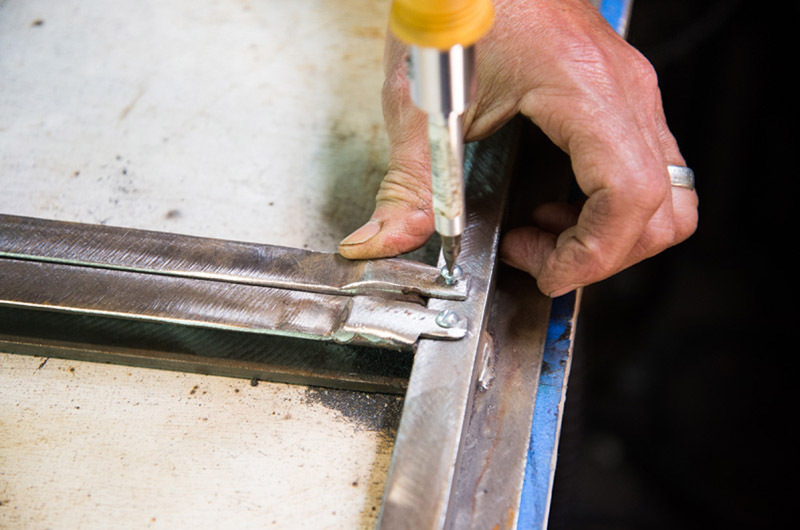 Before he begins working with glass, he welds window frames to match the correct measurements to fit the glass. He cuts base glass for each opening, adds metal oxide, then a stained glass layer. He puts the recipe in the kiln until it all fuses together, then runs a bead of silicone on the insides of the window frames so the glass never touches the metal. He also laminates certain pieces of glass to give them a white light and hammers others to get different patterns. Mr. Zeitz said he feels personally connected to the project in part because of a lack of knowledge of his own heritage. He says it is a problem for most Jewish families. “If you were American-Jewish, and even if you knew where your ancestors were from, if it was Eastern Europe, there’s no house to go look at, there’s no town to go look at. If it was Poland or Russia, it was shtetls and they’re gone,” he said. 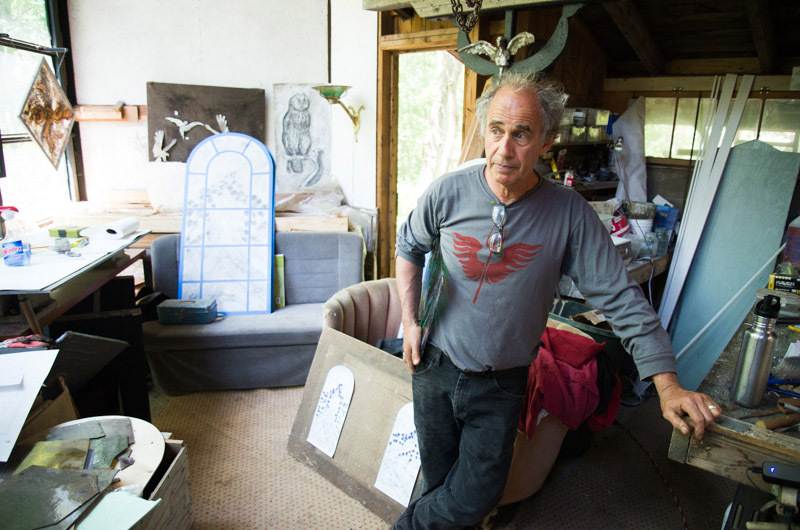 The Barney Zeitz studio is located at 67 Deer Hill Road, Vineyard Haven. Wonderful project Barney. Sounds like you were the first name offered for it. If they spent a year considering 1000 other artists they would still have picked you. Some things are just meant to be. I look forward to stopping by and seeing the work. This is a very important project reminding people that the past is ever present. This is a beautiful homage to history. So proud of my childhood friend and his fabulous work. You provide a unique view of the world as you think it should be. Peace and love. What a wonderful project! The class of 69 is very proud of you.